COLUMBUS, Ind. – Class 8 net orders totaled 34,735 units in April, continuing an above-capacity trend, according to the latest figures from ACT Research. “As has been the case through the past seven months of rising backlog, the U.S. and Canada were the primary drivers of April’s market strength,” said Kenny Vieth, president and senior analyst of ACT Research. Medium-duty orders fell 4,500 units from March, to 24,917 units, according to ACT. Medium-duty orders year to date through April were up 25% compared to the first four months of 2017. “The heavier end of the medium duty market continues to outperform the lighter end, with Class 5 orders in April improving 4% year-to-date and the Classes 6-7 April orders bringing that segment’s year-to-date rise to 37%,” Vieth said. 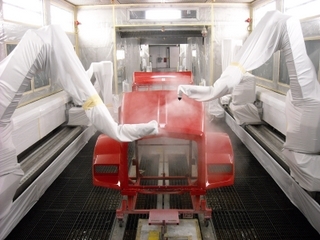 High-tech robots paint a Kenworth truck cab at the Chillicothe plant.